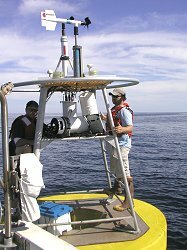 The Ocean Circulation Group within the CMS-USF, headed by Professor Robert Weisberg, engages in physical oceanographic studies of the ocean circulation and the interactions between the oceans and atmosphere. Present emphases are on the West Florida Continental Shelf (WFS), the broad, coastal ocean region between the shoreline and the deep Gulf of Mexico, where the circulation provides the connectivity, which is of fundamental importance to all aspects of ecology. 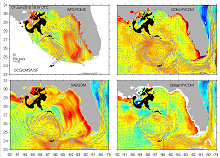 Our approach includes a coordinated program of coastal ocean observations and numerical circulation models. We recognize that there can never be enough observations and that models alone are of limited use. It is through the coordination of these activities that we achieve an improved understanding on the workings of the coastal ocean. Our observational program includes the use of moored buoys, hf-radar and a combination of profilers and gliders (joint with the CMS Center for Ocean Technology). Models presently consist of an eastern Gulf of Mexico, WFS N/F model using ROMS nested in HYCOM and various applications of FVCOM for higher resolution studies of the estuaries and the interactions between the estuaries and the continental shelf.